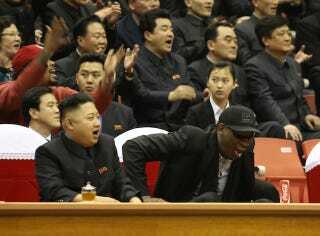 The U.S. State Department Actually Clarified That Dennis Rodman "Has Never Been A Player In Our Diplomacy"
This despite Rodman's obvious, if preliminary, success at ingratiating himself with a historically taciturn North Korean leadership. Don't look a gift horse in the mouth, U.S. State Department—this drying out period/jaunt through the Democratic People's Republic could well be the first step towards a demilitarized North Korea. Give the new era of Celebrity Rehab diplomacy a chance. Gulag this, gulag that—if the dictator is on board, what are you complaining about? Alas, Rodman is now in Beijing for whatever reason, and relations between the U.S. and North Korea remain chilly. We keep sending over our best and brightest, and Kim Jong-Un has yet to yield to democracy. The new strategy for anyone hoping to breach the North Korean border without drawing the ire of the White House: Stick to sports.